MyBioSource manufactures and supplies human and mammalian proteins as well as proteins from a myriad of lower organisms. Proteins may purified from natural sources or created artificially. Proteins created artificially are typically referred to as recombinant proteins or proteins manufactured through genetic engineering. Genetic engineering involves cloning genes into plasmids to generate recombinant DNA, which is sometimes referred to as "chimera" DNA when the recombinant DNA originates from more that species. Jelly fish GFP, a protein composed of 238 amino acid residues, can cloned into a plasmid along with genes for human or mammalian proteins to generate a chimera recombinant protein with a GFP tag. This GFP technology is used for detectability of a protein that exhibits bright green GFP fluorescence when exposed to light. The His peptide tag, containing ~6 amino acids, and the GST peptide tag, containing ~211 amino acids are also among the most common protein tags used in genetic engineering for proteins created artificially. E. coli, yeast, baculovirus, and mammalian hosts among the most common hosts for proteins created artificially. We should also familiarize ourselves with the term 'metabolic engineering' referring to the use of genetic engineering to optimize the metabolic machinery of the hosts to render them efficient manufacturers of high quality protein. Commercially manufactured proteins are expressed from hosts optimized through metabolic engineering. The expressed proteins are then purified by highly developed proprietary methods resulting in high quality human and mammalian proteins or for that matter proteins from any species of choice. Even though we speak of proteins created artificially, we should keep in mind that proteins are simply a group of organic molecules and in this regard may function and act similarly to the natural protein. The specific functionality of a recombinant protein often must be empirically determined. There are many factors which influence the functionality of a protein. 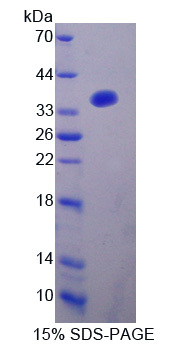 This includes the host employed for recombinant protein expression as well as the type of protein being expressed. Different hosts have different cellular machinery and capabilities for protein modifications. Likewise, different proteins such as protein hormones, peptide hormones, glycosylated proteins, phosphorylated proteins, and enzyme proteins all have different needs for functionality. Likewise, many applications employed for recombinant human and mammalian proteins, as well as proteins from other species, may not rely on biological functionality. MyBioSource offers free consultation services to help you determine your recombinant protein needs, including custom design. Protein manufacture services also include, upon request, tag removal, endotoxin removal and aseptic manufacture. 1. Cloning Stage: We perform gene sequencing to ensure completely correct amino acid sequence. 2. Protein PurificationStage: Our protein is purified by our unique chromatographic technique under mild conditions to avoid activity loss, and our protein is soluble. 3. Protein Detection Stage: We perform SDS-PAGE identification to ensure 90% or higher purity. 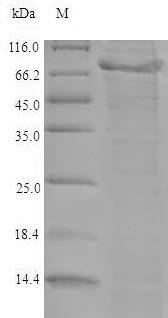 Upon request, we also perform western blot analysis of the tag antibody. 4. 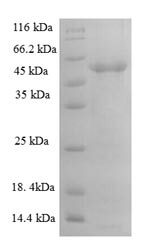 We also an antibody service as an add-on to your recombinant protein, where you protein is used as immunogen to generate a rabbit polyclonal antibody. We offer the flexibility of expression in E. Coli, Yeast, Baculovirus or Mammalian Cell hosts. Proteins are produced under mild conditions to avoid activity loss. Additional services are also available on upon request. Please click here to here to submit your protein request! Displaying 51 to 100 (of 47828 products)	order by Products Name.